Blackfriars Railway Bridge was built in 1864 for the London, Chatham, and Dover Railway. After the formation of the Southern Railway in 1924, the Waterloo Railway Station became the chief hub and this bridge fell into disuse. In 1985, the bridge's superstructure was removed. St Paul's Railway Bridge was built next to Blackfriars Railway Bridge in 1886. It is a five-span, wrought-iron, deck-arch designed by John Wolfe-Barry and Henri Marc Brunel. 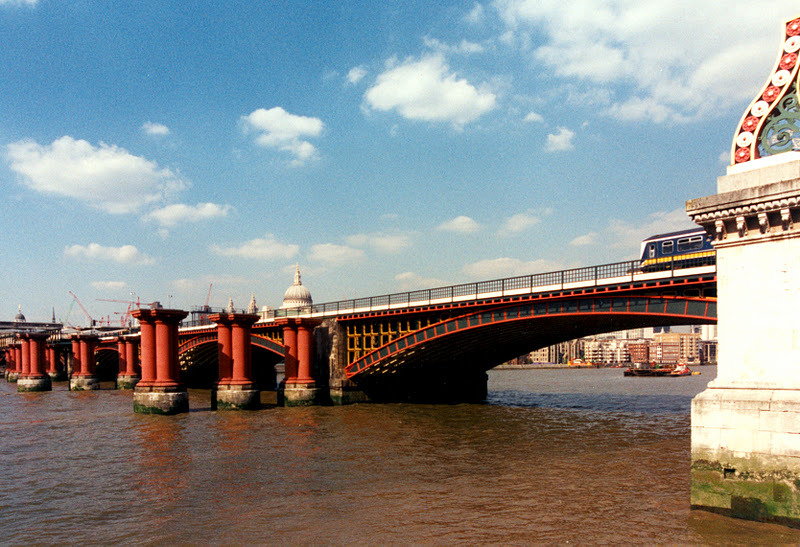 When St Paul's Station was renamed Blackfriars in 1937, the new bridge became the Blackfriars Railway Bridge. The existing piers of the old Blackfriars Bridge are eventually going to be used to support an extension of Blackfriars station across the Thames. Thames River Bridges: Blackfriars Railway Bridge by Mark Yashinsky is licensed under a Creative Commons Attribution-NonCommercial-ShareAlike 3.0 United States License.